May 5th saw us off on the Shinkansen from Ueno station to Fukushima, where we were to meet Ota-san, our guide and interpreter for the day. We were initially a little worried about visiting that area, due in no small measure to the earthquake and tsunami that occurred last year, though Ota-san mentioned when questioned about it that the media had completly over-played the issue. In Japan 1, I mentioned that Tokyo was big. The first couple of pics were taken from the windows of the train and show just how crowded the buildings are. The astonishing thing is that the view from the train window didn't change much in 90 minutes...and that's travelling at 180mph! There may have been a few rice paddies to be seen, but it's essentially 'built up' all the way from Tokyo to Fukushima. Having arrived at our destination, we were met by Ota-san and transferred by taxi to Fujiyasu-san's forge, some distance outside the city, where there was in fact a little countywide to be seen. I've always had a fascination for old Japan, which was probably initiated when I read 'Shogun' years ago and for me, nothing quite sums up the era of the Samurai than their swords. There are plenty to be had in the souvenir shops and they do look the part...but in all cases, they're fake. Not the 'real deal' or even anything halfway close. 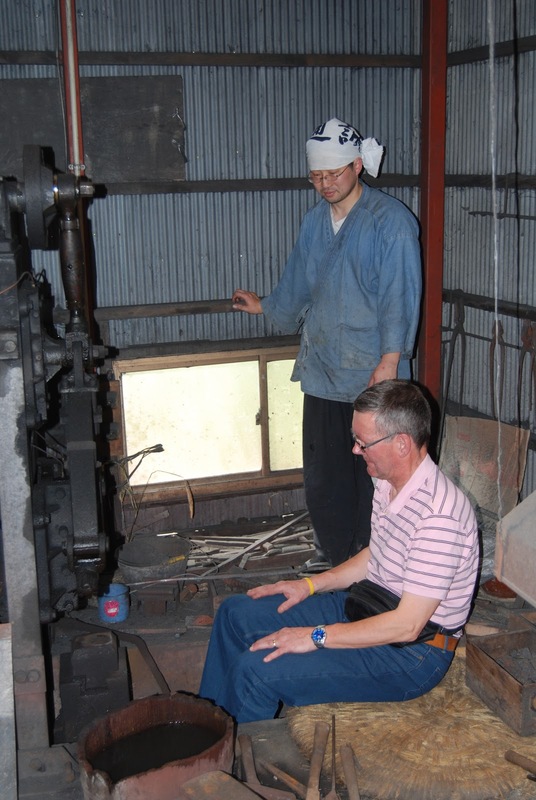 Fujiyasu-san (in the white shirt, seated) has been making swords for the last 40 years and each blade attempts to emulate those produced by the masters hundreds of years ago. Nothing was ever written down, so the process is a bit 'by guess and by God' although as Fujiyasu-san is a follower of the old religion, it's probably something else! ...without pay and with two days off a year. Staggering as this seems, as a maker in the old tradition, this is always how it was done, though it remains to be seen if he'll be replaced when it's time to set up his own forge. After brief introductions, I was summarily put to work wielding the hammer... and bloody heavy it was too! 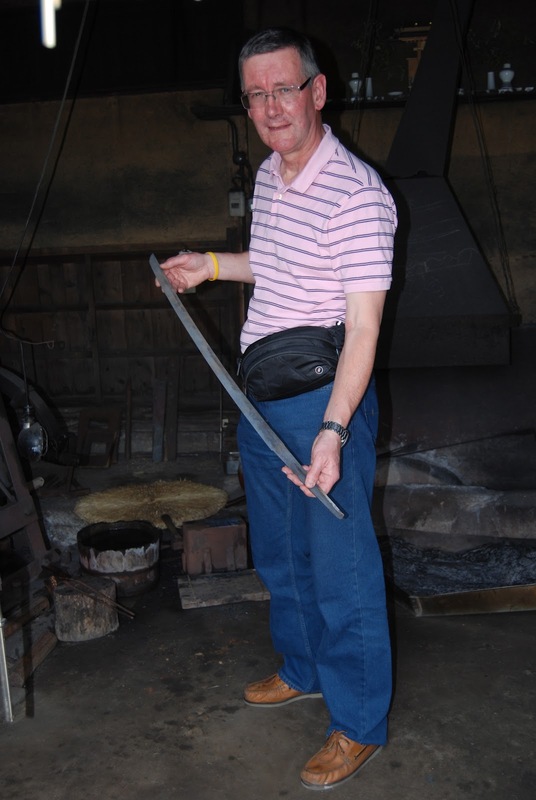 Fujiyasu-san has a smaller hammer which he uses to tap the anvil three times. Tap, tap, tap and then BANG...the big sledge drops. ...both of use to wield the hammers. ...it's time for the initial polishing on waterstones. Nakanishi-san is shown in the pic working on a straight blade. From our conversations with Ota-san, it seems unlikely that Nakanishi-san will be replaced...after all, would you work for seven years for no pay and two days off each year? 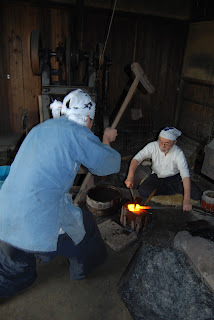 In which case Fujiyasu-san has the option to use a foot operated spring forge hammer (shown above) but it seems unlikely that he will as it's counter to the old tradition of sword making. 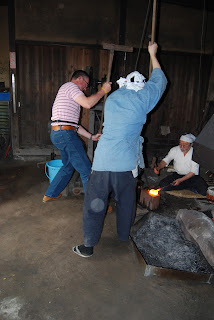 The sad though inevitable conclusion that can be drawn is that Fujiyasu-san will stop making swords...either that or he needs to offer his disciple a commensurate wage and conditions of service, though that is beyond the remit of this Blog. 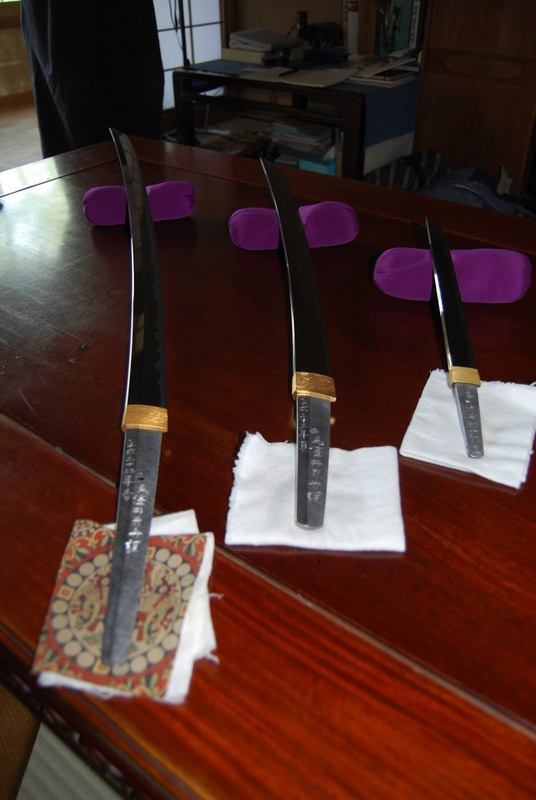 The last stage in this complicated process is to obtain the 'hamon' or decorative pattern on the blade. This is achieved by applying a fine slurry of charcoal and ore to the blade, after which it's fired in the forge for the last time. I'm shown in the pic using a bamboo spatula to coat a small tanto, or dagger and believe me, the process is a lot harder than it appears! ...it's a thing of true, but deadly beauty. I had to be extremely careful not to touch the blade, not only because it's mind numbingly sharp, but any finger marks would eventually turn to rust...hence the cotton pad in my left hand. ...3,000,000 JPY or roughly £30,000 and if you're a serious collector, probably worth every penny. That's not quite the final story though because after lunch, Fujiyasu-san went outside and brought in a peculiar banana shaped bundle and he asked me to hold one end. He then tugged on the other end and produced a blade that was around two metres long! Suitably gob-smacked, he asked me (having previously discussed filthy money) what I thought it was worth? With much 'umming' and 'aahring' and sucking of the teeth, I hazard a guess....10,000,000JPY perhaps? The day ended with me giving a gift of Scotch whiskey in a small box which I'd made in the 'shop much earlier. Needless to say, it was suitable appreciated. As a footnote to this long and complicated entry, it seems that in the not too distant future, Fujiyasu-san is likely to become a Japanese 'National Treasure'. If that is the case, everything he makes, or has made will instantly double in value. Got a calculator handy?...you do the maths! What a fantastic experience. Thanks for taking the time to document it and take pictures. As you say these skills may not be around for long. Thank you for the post. May I have contact of Ota-san :) ? I am a travel consultant and want to promote this program.